LG's President and CEO Dr. Jony-seok Park has said that the company's goal is "to offer the widest variety of LTE smartphones in the industry in 2012". LTE 4G is the next step up in mobile networks and will deliver faster data speeds. Support for LTE is cropping up in countries around the world – however here in England we've still got a bit of a wait. With LG openly supporting LTE and striving to deliver a wide range of LTE handsets this year it may speed up the introduction of technology in the UK, as Britain slips further behind other countries in terms of its mobile network. Speaking at the launch of LG's latest LTE handset the Optimus LTE Tag, Park went on to say the Tag looks to build on the success of the original Optimus LTE and "offers a truly innovative feature" called LG Tag+. LG Tag+ uses NFC technology in the phone and a set of stickers or "tags" which a user can program to change the handset's settings when it's touched on a tag. Now this all sounds very familiar, with Sony's SmartTags system seeming to deliver the same functionality and shows that mobile manufacturers are starting to take NFC technology seriously. 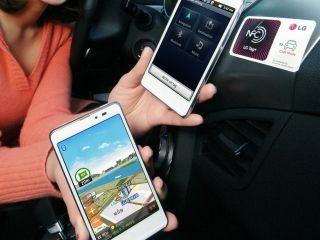 The LG Optimus LTE tag with its 1.2GHz dual-core processor, 4.3-inch screen, 5MP camera and 16GB internal storage is currently only set to launch in Korea. However we could well see other LTE-toting LG handsets make it to Europe in 2012. We will be at MWC 2012 in Barcelona next week to see what phones LG has planned for the year and how it's going to integrate LTE and NFC in its handsets.